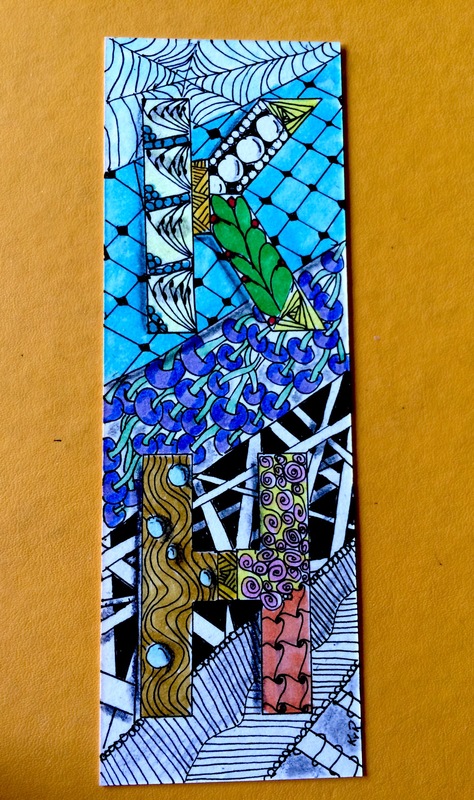 Posted on June 15, 2015 by Kat, aka "ArtyKat"
So, without further delay, here is my entry- it is a bookmark (my first ever) that I made for my very dear friend of 31 years (can that be right?!?!? Yep it is!) 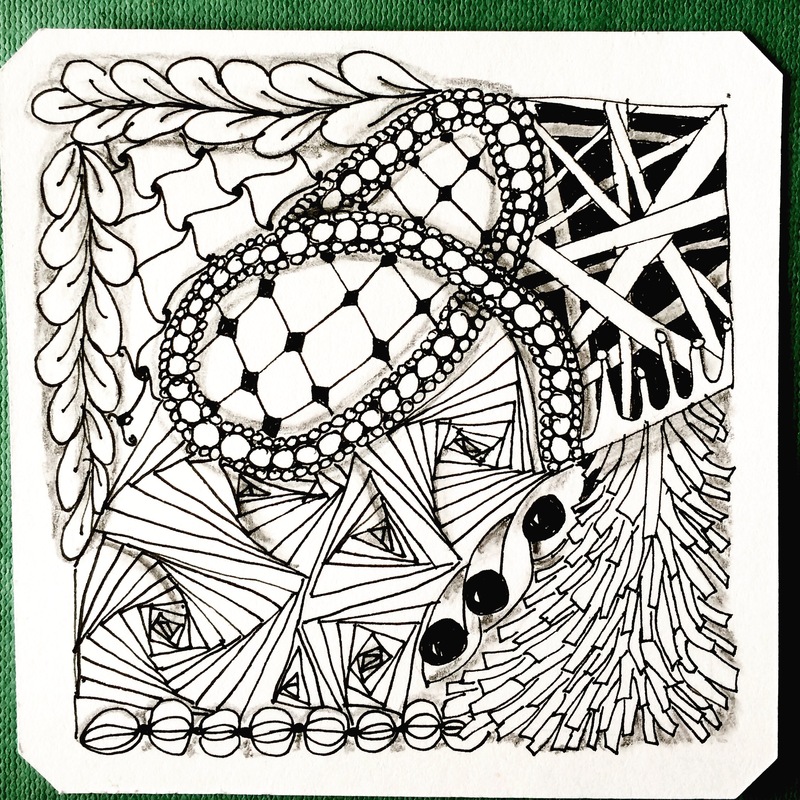 in Illinois who always gets my “firsts.” It was her idea that I Google “Zentangle” as I was frustrated and stuck in my creativity – or lack thereof. By far the best Google search of my life! Not very Zentangly but I gave it a serious try! And this pitcher was an accident! I simply closed my eyes and made one line. I close the line and started… And in a short time after turning it all ’round to tangle it, the pitcher emerged. It was quite apropos and a good symbol for our friendship. I’m sorry if it is too big! I can’t figure out how to make it smaller. I thought I’d better get this completed and posted today since I leave early Saturday morning for RHODE ISLAND! I’ll be attending and hopefully graduating the CZT20. That’s Certified Zentangle Teacher training number 20. It is a 12 hour drive and complicated due to my disabilities and medical conditions but my friend of 5 years here in Appalachia will act as my assistant. I’m so excited I can’t even sleep more than 5-6 hours a night! 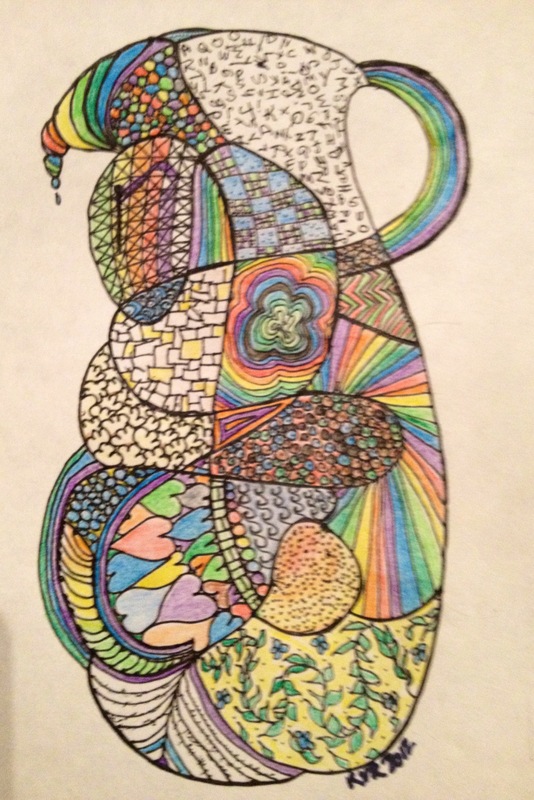 Posted on June 9, 2015 by Kat, aka "ArtyKat"
I am so excited because my trip to Rhode Island to attend the 20th CZT session is less than 2 weeks away! When it’s over, all being well, I will be a Certified Zentangle Teacher. I’m a retired grief and trauma resolution therapist and have lots of ideas brewing about merging the two (therapeutic drawing). I recently discovered an Instagram page @iamthediva and subsequently found out about her challenges. Go to I Am The Diva website to see what I mean. This week is #221 Beads of Courage, and my Zentangle tile has three patterns that contain “beads. Do go to the site and find #221 and read it all the way through. One of my “bead” patterns is one I created but I’m sure it already exists. It is called Beanz because the core looks like a coffee bean within a bead, with a black small bead between them on a strand. It’s at the bottom of this photo. PS I made a second tile, and it is the next post. Please visit and see it! It is for http://iamthedivaczt.blogspot.com challenge.